Certain church authorities opposed the Knights for reasons other than its secrecy. Some believed the order's goals promoted godless socialism and communism. Others simply thought it was wrong to promote the redistribution of wealth as the Knights did, in their demands for higher wages for their labor. Michael Augustine Corrigan, the Archbishop of New York from 1885 until his death in 1 902, was an outspoken opponent of the philosophy espoused by the Knights of Labor and others that advocated changes in property distribution. Corrigan's views were expressed during a bitter conflict that plagued his archbishopric for ten years, known as "the McGlynn controversy." Father Edward McGlynn served as the priest of New York City's largest parish, St. Stephen's. A longtime advocate of social reform, McGlynn became an influential supporter of the Mayoral candidacy of Henry George, who advocated property tax reforms that would close the gap between rich and poor. Archbishop Corrigan, on the other hand, believed such reforms would violate an individual's right to private property. McGlynn was suspended by Corrigan after continuing to support George despite being ordered not to do so. George lost the election, and Corrigan took the step, unusual in its forthright support of a particular economic position, of condemning George's theories in a pastoral letter. 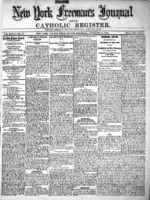 The letter outlines in broad strokes a point of view held by many economically conservative members of the church, a view that informed opposition to the Knights of Labor. Corrigan never came out and explicitly condemned George's theories, but the letter was intended to apply to his and other theories that challenged concepts of private property. Focus on section one, titled "Faith." The archbishop writes in this section of his letter that "a highly important duty of a Bishop's office is to be quick in discerning dangerous movements and prompt in sounding timely alarm." To which dangerous movements is he referring?